The biggest issue I noticed was that he has a pronounced forward weight shift when finishing each rep at the top of the movement. You see, he doesn’t know how to extend his left hip. He doesn’t know how to extend his left hip without compensation. Instead of allowing the left half of the pelvis to posteriorly rotate underneath him, he drives the motion from his back and shifts his weight forward. This allows him to hang on his left foot, ankle, and anterior hip structures. What I would rather he do is finish with his tailbone underneath him like he’s pushing his heel through the floor. Now what do I mean by this posterior left hemi-pelvic rotation? Hip extension is a relative term. I can get my femur behind me without extending my hip by using my back. If the left innominate doesn’t stay over the femoral head, then I’m not doing anything to retrain him out of his R-sided bias pattern. The screenshot above is from a coaching video he sent me. If you want to check out that video, sign up for my newsletter to get a link to all the premium content I’ve ever made and will ever make. 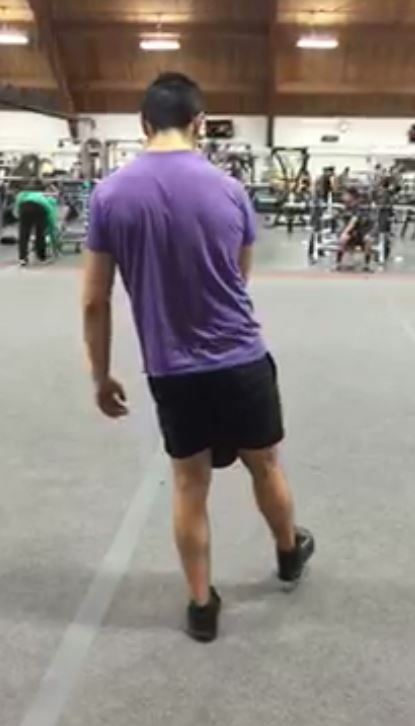 In the video he sent me, there’s one rep where he swings his right leg forward, but delays the onset of his forward weight shift. His right leg comes forward on each rep, but it doesn’t flex the same as I would want it to… except for this one rep.
Left leg is down, right leg is up… this is gait. He’s teaching himself how to stand on and push off of his left leg while reaching forward with his left leg. This observation geeks me out and supports the diagnosis that his left hemi-pelvis is not posteriorly rotating to stay underneath him. We are re-educating his gait pattern. My favorite part of this video was that he made his videographer swing all the way around to get the shot instead of just turning around and facing the other way. Haha. Now this looks way different, wouldn’t you say? His knee is more bent and he’s crunched over. This is the top-most position of his lift. His right-side-bias pattern makes it easier for him to extend his right hip. He’s comfortable with it there. In fact, he told me that this side feels wayyyy better. I would argue that the only reason this side feels better is because he’s getting sensory information that he’s used to. What do I mean by that? He’s driving his right heel into the ground. And he does that all day. Another thing you’ll see in the video is that he stumbles on this side. When he does his left side he falls all over the place, but he never actually loses his balance so much that he has to take a step to reset himself. He does that on the right side. And which side did he fall to? The right, i.e. towards the camera. Lastly, I want to talk more about his head position. You see how it’s tilted forward? This tells me he’s trying to stabilize his midsection with a lot of rectus abdominis because he doesn’t know how to use deep abdominal musculature like the internal obliques and transversus abdominis. He’s pulling his sternum down with rectus, but his ribs are still flared up, at least relative to his sternum. He’s going to have a hard time expanding his rib cage in three planes of motion if he’s not anchoring them down during this loaded activity. Do I want him bracing to force his ribs down? No I do not. I want him to let them come down. 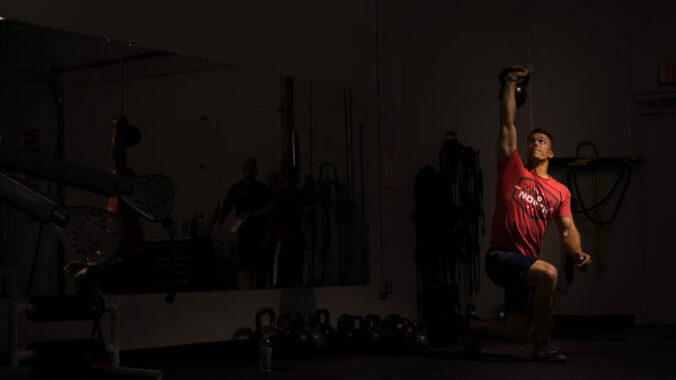 I want him to set up with a full exhale to bring those ribs down, then I want him to hold that position while he does this exercise. Ribs down does not mean crunched. Nor does it mean this is the “optimal position” to be in. This is simply where I want him right now. We need to teach him how to use those big oblique muscles instead of overrelying on his rectus abdominis and anterior neck musculature. I hope everyone has a seat, but you’re only going to need the edge of it. The show is starting now. Did you guess that he would look like that from behind? You can only minimally tell what’s going on in the frontal and transverse planes when you’re looking at a sagittal (side) view. Make sure you coach from multiple angles. This dude lives in the sagittal plane. We have a kid at IFAST who reminds me a lot of this guy. Strong, sagittal plane monsters. Single leg work is their Mt. Everest. This dude doesn’t know anything about a frontal or transverse plane. He doesn’t know how to stand on one leg. He doesn’t feel comfortable in the hole of a squat because his pelvis doesn’t know how to move. These days, a lot of people as me, “Would you try to change that?” I believe that is a very important question that requires a complex thought process and leads to an answer that is easily littered with caveats. This dude’s goal is to be a machine. He wants to bench 400lbs. Intuition says that restoring his movement variability will increase his instability and make him weaker. But this kid can’t even get into a position to lift. 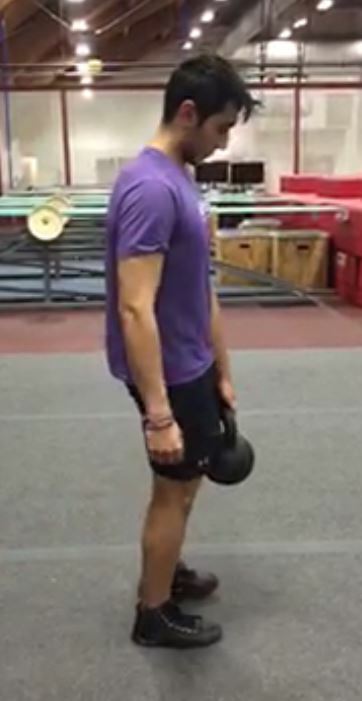 He can yank 500lbs off the ground by leaning back into it, but he can’t squat because he runs out of sagittal plane freedom before the lift is over. The human body can only compensate so far in one direction. Would I try to change his stabilization pattern? He cannot operate in his current condition. That’s why he came to me. He needs to learn new patterns that don’t wear him down so fast. He needs to learn how to move his pelvic innominates in the correct direction at the correct time. He needs to learn how to support his body instead of letting his body support him. Man, that’s a lot straighter, isn’t it? On this side, you can’t see it in the picture, but he has a really wobbly ankle. It especially likes to roll outward, i.e. invert. Remember when he fell to the right before? Instead of closing the left side of his body in a smooth lateral flexion curve, he kind of just hinge in the middle of his back because that’s how he gets his left foot off the ground. His left ilium never comes in towards his midline. His left ribs never deflate, which makes dropping that left shoulder really difficult. 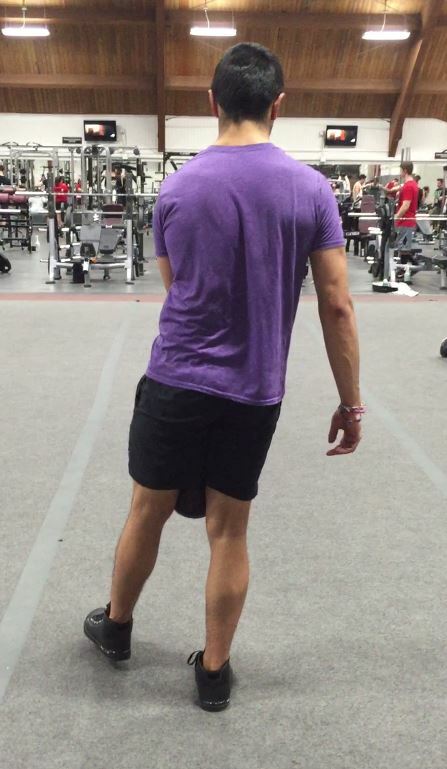 I wouldn’t be surprised if he had a “click” or annoying feeling underneath his left shoulder blade in this position. I’m talking about his left side, but we can talk about his right side if you want. He’s not using a glute to push his body weight up. He’s using an adductor magnus to pull him down on top of himself and increase the sensation he feels because he doesn’t know where he is in space. You can look at it like a sensory deficit, a motor deficit, a strength deficit, an inhibition deficit, or a neurological patterning deficit, but I would suggest you look at all of it concurrently, determine the limiting factor at that point in time, and then address it. So what do I ask him to do? On the left side, I want you to exhale fully with both feet on the ground as you shift 80% of your weight onto your left foot. 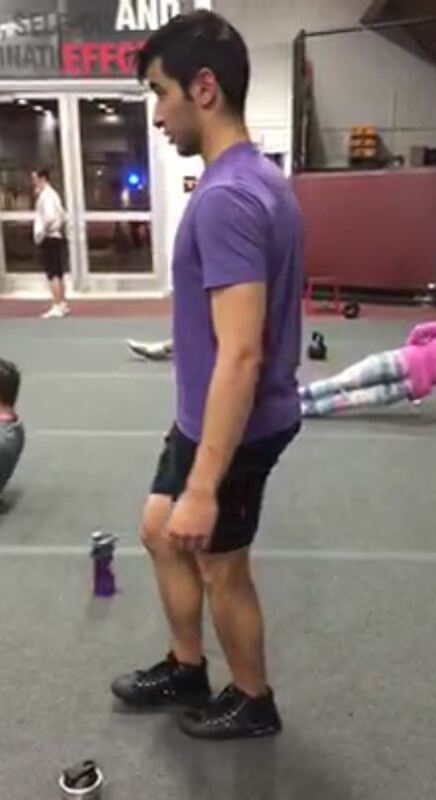 I want your tailbone tucked underneath you and your zipper to stay over your left leg throughout this exercise. You should feel your left inner thigh muscle turn on when doing this. Be gentle, let it happen, and don’t force it. Finish tall through the heel. On your right side, I want you to exhale fully and drop your left shoulder down toward the ground while fixing your eyes on something in front of you. You should feel your left abdominals engage. If your right glutes don’t burn like crazy by the end of the set, you’re doing it wrong. Try that and send me another video so I can see if it worked or not. Do you find this elucidation of my thought process to be helpful? If you do, I’d love it if you shared it with someone.